Flowers burst into bloom, and all too soon fade away. 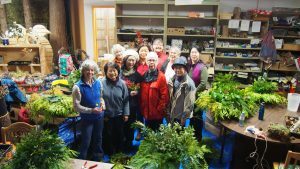 As VanDusen Botanical Garden bids farewell to the volunteer Dried Flower Arrangers (DFA) we remember their creative work that carried spring and summer’s vibrancy on into the winter months. The Dried Flower Arrangers have been a perennial presence in the Garden since the 1980s, when the Garden Guides formed new volunteer groups. Meeting Wednesday mornings, the DFA viewed itself as a “quiet presence”, but their colourful floral plot in the Garden made quite a statement. DFA member Judy Howard noted, “it was enjoyed by visitors to the Garden, especially photographers, because of its emphasis on flowers,” and “people with small gardens found inspiring examples of what they could grow.” Others were curious about how to dry flowers. DFA members brought their talents. Lynn Bagnell, who retired from a garden centre enjoyed “the seeding, cutting and collecting of greens.” Judy, a Master Gardener, stated that it “is [in] my genes” recalling her grandmother’s dried flower and shell arrangements. This type of craft reached a height in Victorian times, but the use of flowers to preserve memories is thought to be ancient in origin. Shared talents included a cross-cultural sense of beauty, as Judy expressed, “It was a mixed group with lots of ethnicities such as Russian, Iranian, and Chinese. It was an entry point for newcomers with limited English into other volunteer activities in the Garden. People brought their cultural perspectives – use of different colours [and] adornments [which] enhanced traditional flower arrangements.” Flower arranging has worldwide roots including Japan’s art of Ikebana. The Dried Flower Arrangers wound down with characteristic generosity. 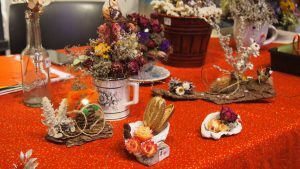 They held successful sales three times a year and their last sale featuring Christmas decorations, greenery, and more, produced their largest ever donation to the VBGA. The DFA generously offered desirable perennials such Astilbe, peony, Centaurea, boxwood and curly willow to the Potluck Section of the VBGA Plant sale. The group looks forward to seeing the metamorphosis from DFA Garden to a new teaching garden hosting camps, classes and more. The VBGA wishes to thank the dedicated DFA volunteers for their valuable contribution of time and talents to the Garden. Their dedication and artistry will remain pressed in our memories. Volunteers truly are the heart of our success and we look forward to continuing to work with these committed individuals in new roles.